I may not like coffee or tea, but give me cup of hot chocolate on a cold day and I am very happy. I will say that I am a bit picky on my hot chocolate. If I am going to drink a cup of hot chocolate I want it to be good. I like it rich and creamy. I have never been much of a fan of the mixes like the famous swiss miss type ones. If I am going to use a mix for hot chocolate, I prefer one that is a little more gourmet. The flavored hot chocolates are some of my favorites. Over the years I have tried making my own mixes, but have never gotten it quite how I wanted it. They were not rich and creamy enough. I was looking for something more like the more expensive mixes that I bought in the store and most homemade mixes are not like those. But over time and with quite a bit of tweaking I found a homemade hot chocolate mix that is just what I wanted. It is rich and creamy and perfect. What makes this homemade hot chocolate different? It contains not only cocoa, but chopped up chocolate chips. Yes, melted chocolate will always add a nice depth of flavor and creaminess to things. Not only do the chips add creaminess, they allow you to change up the flavors. Think butterscotch hot chocolate or mint hot chocolate. YUM!! This homemade mix would also make a wonderful holiday gift. Make up a few different flavors and place them in jars, and they would make a perfect gift for anyone. I love the idea of making a gift basket or tray with these. 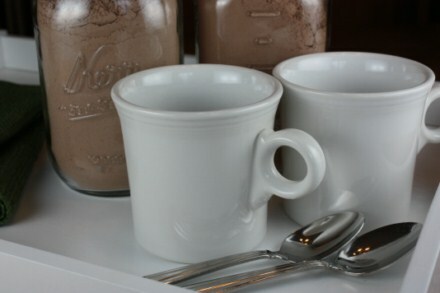 Include a few jars of homemade hot cocoa mix, a couple of nice hot chocolate mugs, and maybe some spoons and napkins. What person would not enjoy a gift like that for the holidays? Homemade Butterscotch Hot Cocoa: Substitute butterscotch chips for the chocolate chips. Homemade Cinnamon Hot Cocoa: Substitute cinnamon chips for the chocolate chips. Homemade Dark Chocolate Hot Cocoa: Substitute special dark chips for the chocolate chips. As you can see the flavors are endless. I was thinking RASPBERRY! So good with chocolate. @Darlene, Raspberry would be so good! It is perfect with chocolate. I need to try that one. Ok, clarify for me. I once made a homemade mix like this and it BOMBED. Cocoa? I added baking cocoa… I STILL don’t know what I was SUPPOSED to use, but obviously not BAKING cocoa. Where do I find the stuff I’m supposed to use? @Amy @ Finer Things, That is one of the reasons that I did not like homemade mixes. Many are bitter and don’t have enough sugar. I think the powdered sugar in this one helps. So, does the ducth processed or use Hershey’s special dark cocoa which is a combo of cocoa’s. Neither of those are as bitter as regular baking cocoa like you would use in brownies. You can find both of those on the baking aisle at most stores, at least in my area. Wow, it looks wonderful! I’ve never been happy with homemade mixes either so I can’t wait to give this one a try and see what the chocolate chips do for it! Thanks for the recipe! This will be so good to have on hand for company! Thanks for all the work you put in on your blog! I have so enjoyed it ! @sondra, Thank you I am glad that you enjoy my site. Thank you for reading. I cannot wait to try this! I don’t like coffee or tea, but I love to enjoy something warm on a cold night! There is one mix that I like, but it is expensive. Can’t wait to try making my own! Thank you for sharing and for all your work to create a recipe you love! I have been thinking for two weeks that I need to make this! Now that I have an even better recipe for sure gonna make it this weekend! Especially since we are getting snow tomorrow night the darn kids will want hot chocolate after they come in from sledding. I was just thinking yesterday that I needed to find a good homemade hot chocolate mix! Thanks! @Jane, I had to look on the box, because I thought all powdered milk was the same. The kind I buy says instant powdered milk. What kind of choclate chips do you use- semi-sweet or milk chocolate? @Stella, Either one will work fine. I would used the one that you prefer, or try both and see which one you like best. Wonderful website. Keep up the good work. @Sharon Howard, Thank you! I am glad that you enjoy my site. Oh, I love hot chocolate too! My mix recipe is very similar, only it has less powdered milk and the addition of powdered creamer. We have found that making a very stong raspberry tea and using it in the place of hot water is very yummy! I also like to add hot chocolate mix to coffee. How many small or large jar gifts would this recipe make? @Kelly, This fills a quart jar almost perfectly. I am saving this recipe. I just came over here from your caramel hot chocolate post. I was so glad to find this, as its cold and rainy here (no snow yet) but my 6 year old son just asked me for hot chocolate. He and my daughter are eating this off their fingers cause they say it tastes so good. Can’t wait! We don’t have any Andes candies but are going to put in some peppermint extract for the peppermint hot chocolate. @Chrissie, I am so glad that your kids enjoyed it! My kids had it with breakfast this morning also. Lynn, I see that you used the instant powdered milk. Is there a particular brand that you use. Like the comment earlier, I tried a similar recipe and the milk did not dissolve well. There were little floating pieces of milk in my test cup. Did you previous recipe call for putting it all in the blender to make it a finer powder, Alicia? I’ve had really great luck with this recipe, but I think chopping it up into such a fine powder in the food processor is key! This is the same mix I use but I use white chocolate chips. I put it in my coffee for a cafe mocha. Oh and i have a hard time finding dutch processed cocoa in the grocery stores near me. I order it from King Arthur Flour. I can’t get the special cocoa but I do have a bag of dark chocolate chips. Could I substitute that for the dutch processed. Maybe do 1/2 cup chips & 1/2 cup baking cocoa? And still use 1 cup of other chips? I love hot chocolate and have never found a good recipe – but this sounds great. I did make a hot chocolate that was on the Hershey’s website and it was really good and creamy. I couldnt store it – you just had to make a pot that made 5 servings. Thanks for all the great recipes! It won’t totally eliminate the sugar (there’s sugar in the chocolate chips, as well as natural lactose in the milk) but you can substitute Splenda for the powdered sugar. Success!!! I just made this in about 5 minutes (including turning my regular sugar into powdered via my blender), and it tastes GREAT! I used the Nestle “special dark” cocoa powder, which is 1/2 Dutch, and it definitely tastes more like “Dark chocolate” hot chocolate than regular. I also only used 1 cup powdered milk and about 1/4 cup choco chips (all I had on hand), and it still tasted fine made with milk. But I’m definitely going to try and dig up some real dutch cocoa so it’s not so dark next time. ps – I think the key with this dissolving is to make sure and leave the food processor going until you can’t hear the chocolate chips tumbling around and being chopped anymore. This dissolved in my hot milk better than store bought hot chocolate. Thank you soooooo much! My whole family LOVES this recipe!!! You have a wonderful blog! Thanks & God bless! I was just wondering, do you know about how many cups of Hot Chocolate one batch of the recipe you provided would make? I really want to use this as a gift for Christmas, and I’m just trying to figure out how much ingredients I need to get. Thanks so much! I have not figured that out, I am sorry. If I remember right, it makes a little over a 1 qt jar. Next time I make it I will try to measure that, because that would be helpful for others. I’m going to make this but use a Terry’s chocolate orange instead of the chocolate chips. Maybe one of the dark chocolate ones to give a richer flavor, I don’t know, I haven’t decided. But I have this idea that orange chocolate hot chocolate would be one of the most amazing drinks ever. I have never tried stevia, but need to. I am glad you enjoyed it! For the Powdered sugar- is that the same as icing sugar? I am not sure on that. Powdered sugar is the light powdery textured sugar that you use in frosting, etc. It is also known as confectioners sugar. I’m hosting a ladies fellowship and wanted to have the ladies make there own cocoa to go home. This looks like an amazing recipe! And I love the idea of adding different candies to make the flavors different! My goal is to have a big batch of mix made already and then have the candies sitting out for them to add their own. Do you know how much mix to how much of the chips it would be? And how many servings does this make altogether? The recipe didn’t state. I think this recipes makes about 18 servings. I love your idea. Would you still be using the chocolate chips in it or would you be using other chips instead? I’m trying to figure out how to have the ladies make whichever kind they’d like but in a single serving. I’m trying to break the recipe down to one person, and have the different processed chips at the end so they can personalize it to them. We also are making a milk chocolate and a dark chocolate dipped spoon for each lady to take home. Do you have an idea of how much of each ingredient goes in a single serving? And how much of the chips? This looks really good. Could I use sugar substitute for powdered sugar? How long would it keep if it was put in jars and given as gifts? I think it should keep several months fine. Looks great is there such a thing as pwd spy or almond? Would love to make but without the milk for my son due to allergies. We are out for a snow day and made this mix. My little man is drinking a cup and declared it “fantastic”. Thanks!